Enough of anticipation, it’s time for the annual TEDxDhaka conference, we are getting ready and so should you! This year’s TEDxDhaka will take place on November 22nd and the theme is “Breaking Barriers”. 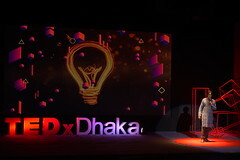 So we resurrected in 2012 with a dream of a “Different Bangladesh” followed by being the change (TEDxDhaka 2012 Be the Change), facing some problems and using it as catalysts for the change (TEDxDhaka 2013 Problems as Catalysts) and now we are up for Breaking Barriers, overcoming all the obstacles and forging a new era. TEDxDhaka Breaking Barriers will take place on November 22nd 2014. The registration application for attending the event is now open! Click HERE to apply. Please keep an eye on our social networks Facebook, Twitter for updates. Pacing the stage at the first afternoon session of TEDxDhaka 2013 was one of Bangladesh’s most artistic minds: Shahidul Alam. 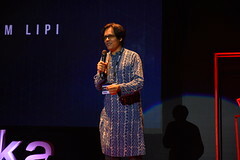 The founder of Pathshala, he is an award winning photographer whose institute in Bangladesh trains journalists, helping to imbue them with the skills and values necessary to create positive change. Next, Rubaiya Ahmad, an animal rights activist and the founder of Obhoyaronna, talked about why and how we should stop the everyday cruelty against dogs in Bangladesh. 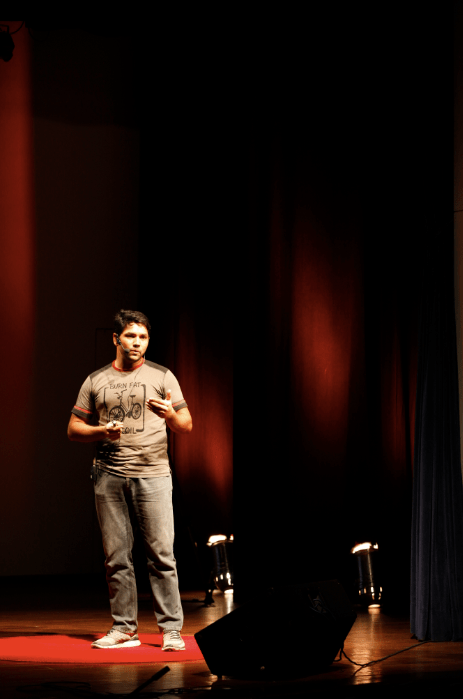 The last speaker, but certainly not the least entertaining, was Yamin Khan – a comedian who got the whole crowd giggling. 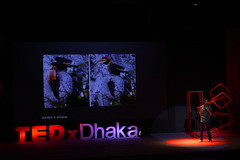 Shahidul Alam narrated real stories of people with real problems, describing how his journey as a photographer opened his mind to different worlds and allowed him to connect with his family, community, identity, and nation on a different level. The title of Dr. Alam’s presentation, Your Eyes are Beautiful, was also part of his closing reflection where we learned the Persian custom: When told that you are attractive, one responds, “You have beautiful eyes ” — meaning that beauty is always in the eye of the beholder. “I have the best hairstyle here,” declared Yamin Khan when he took the stage. A natural comedian (with no hair to speak of) Yamin reiterated the stories of the speakers who preceded him, giving them a light-hearted, humorous twist. Referring to Syeda Rizwana Hasan, Yamin explained why we shouldn’t judge a book by its cover. The sweet, sari-wearing lady could often be mistaken as a TV cooking host not a high powered environmental lawyer! 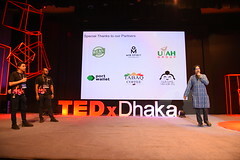 During the second TedxDhaka session, speakers from diverse professions addressed heated issues now present in Bangladesh. 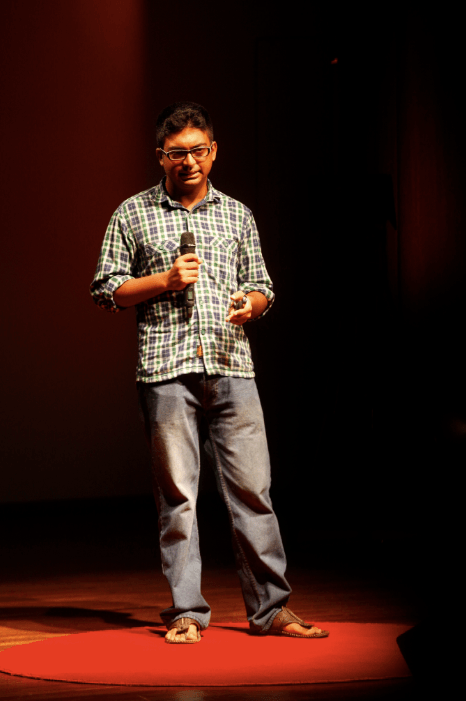 Using the story of the dreadful collapse of the Rana Plaza building, Mamnoon Murshed Chowdhury, an architect, shared his thoughts on how greed leads to destruction. Next, MIT graduates Stephen Kennedy and Albert Ching lit up the event with their funky duet, describing the ways their Dhaka Bus Map–the first ever–could help make public transportation more transparent and less stressful, while helping to build a community of problem solvers and social entrepreneurs. Finally, lawyer and activist Syeda Rizwana Hassan touched on the importance of using environmental laws to protect the communities most susceptible to environmental hazards like flooding, waste dumping, overcrowding, inadequate sewage, and climate change. “Buildings do not kill; it’s our greed”, said Mamnoon Murshed Chowdhury, of the Rana Plaza disaster. While a staggering 78,000 factory buildings are still at risk of collapse, Mamnoon has still managed to remain optimistic. He cites preventive solutions to Bangladesh’s architectural threats at a time when the country is racing into development and prosperity. Maddening traffic is one of the first things that foreigners notice when they arrive in Dhaka. In 2011, the two talented Americans noticed this serious problem and leveraged their training in urban planning to an initiative aimed at making Dhaka a better place to live. While many experts have suggested a variety of solutions to the traffic problem, Stephen Kennedy and Albert Ching used just $15,000 raised through the crowdsourcing site kickstarter to create the first Dhaka bus map. What does a Dhaka Bus Map entail? Stephen and Albert pioneered the idea of “flocksourcing,” using a group of people armed with smart phones and a working GPS system to map bus routes as they happen. They hope that an accurate, easy-to-use bus map will make riding buses an easier, more pleasant experience and in turn, will reduce the number of people using private cars. Easier bus system = less cars = less traffic = a more livable Dhaka. Taking up the complex subject of environmental laws in Bangladesh, Syeda Rizwana Hasan spoke her mind on the current status of Bangladesh’s environmental laws. 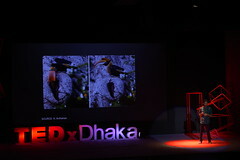 The award winning activist discussed the apprehensive attitude of policy makers and influential people in Bangladesh towards environmental problems. She outlined some of the many cases she has filed on behalf of the environment and reflected on the fact that environmental change is not an easy a task when those who are best served by the system resist any meaningful change. 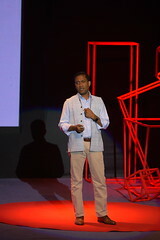 TEDxDhaka 2013 kicked off with exciting stories of how the seemingly impossible can be turned into amazing potential. Speakers like founder of the Bangla keyboard script Mehdi Hasan Khan and founder of BDCyclists Mozammel Haque shared their inspiring journeys, while Google Southeast Asia representative Jana Levene shared her idea of spreading infinite knowledge beyond borders. 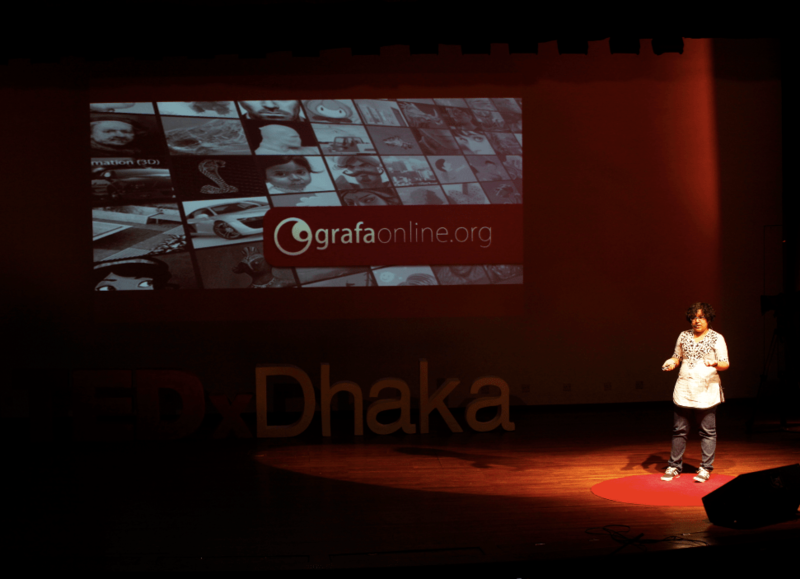 And so, Mehdi, an ordinary 19 year-old boy, headed out to make the Bangla language writable on the Internet. What started as a one-man army trying to build the most efficient transliteration software, ended up attracting a host of bright youngsters, all lending their hands to make Bangla fonts easier to type on the computer. 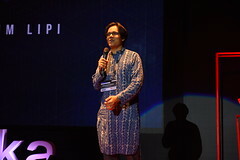 As Mehdi explained, before the launch of Avro keyboard and its wide circulation, Bangladeshi people had to undergo tiresome training sessions to learn techniques of using Bangla text software that were heavily protected under patents. “It was like locking yourself up in your own prison”, explained Mehdi, condemning the suppression of innovation and accessibility so that a few could make money through patents. It is not common for an active life promoter to admit that he does not like to exercise. But then again, Mozammel Haque, the founder of BDcyclists, is not like any other health conscious person. Mozammel’s journey began when he became frustrated with long hours spent in Dhaka traffic. His everyday journeys between home and the office took more than three hours by car. But Mozammel could not afford to spend so much time in traffic. 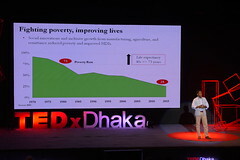 “Instead of being the problem”, he encouraged the audience, “be a part of the solution.” His take on the solution to the grueling traffic jam of Dhaka, was to start cycling to work. What started off with him wanting to bring about a healthy change in his own life, has now become a city-wide trend. Cyclists on the main roads of Dhaka are now a relatively common scene, and Mozammel’s BDcyclists has a lot to do with it. More than a thousand cyclists showed up for one of BDcyclists’ biggest events, the Independence Day group ride. 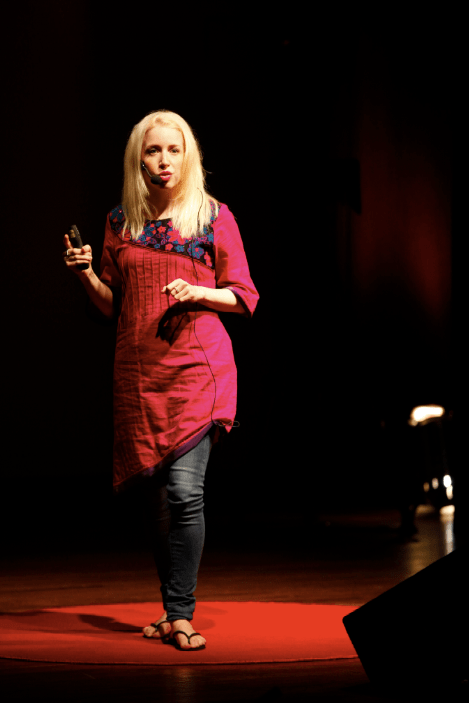 A Googler working in developing new markets, Jane Levene, believes that the next billion users are going to come from developing nations like Bangladesh. She began by explaining how the world is imbalanced. Only a few small areas enjoy the infinite benefits provided by the Internet. She told stories of African fishermen and farmers who were able to start online businesses, raising their income up to 40%! Everyday citizens in Malaysia made their election campaigns more available and promoted a more transparent political culture through Internet portals. In Pakistan, the Internet was successfully used to tackle post-disaster management. Her speech ended with a question to the audience, asking them to ponder upon the infinite possibilities that the Internet could bring about if made available to the whole world. “Anything I liked, imagined, I would draw it”, asserted a quirky Fatema Jannat Mony, who has just finished high school and is now working on her animated short film entitled “Moving On”. Now working in Ogniroth studios, Mony, talks about being blinded with inspiration the first time she was introduced to the Internet. When’s the event? How long will it run? September 21st, Saturday, 2013. It’s a full day event. You have to clear your calendar for the entire day to attend the event. It will run from 10:30 to 18:30. Really?! You don’t know yet? 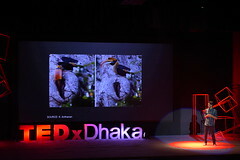 It will happen at the International School Dhaka (ISD) Auditorium. Check out the venue page for details. Check out the full speaker lineup. How long is the registration open? As long as you can see the form in this page and it is written as ‘open’ there. Apply asap! Isn’t 2000 taka (25 $) a bit expensive for ticket? To many of you, yes it is. We tried our best to keep it low and this we found as the most feasible and reasonable to our capacity. Most of our sponsors or partners are in-kind supporters, mostly they are contributing to small things directly with supplies or goodies. Since we absolutely do not allow any advertisement on stage we hardly get any cash sponsor. 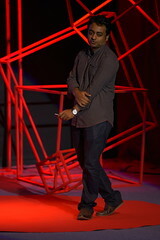 We do not make TEDxDhaka a place of rigorous branding but of creative outreach and thoughtful engagements. 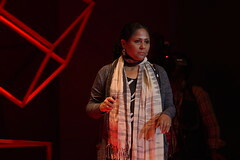 All fund of TEDxDhaka goes back to developing the event itself. 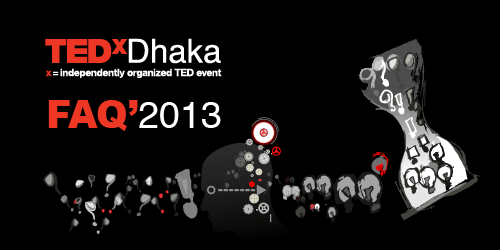 Doesn’t TED pay for organizing TEDxDhaka?! No. TED doesn’t pay the organizers anything. It is fully organized and funded locally and independently by unpaid volunteers, under license and following guidelines from TED. How do you select the attendees? It’s neither random nor first-come-first-serve. We read every single application and decide about someone’s entry to TEDxDhaka individually. We check your ‘openness and enthusiasm’ primarily and there are a few other parameters that we determine from what you write in the form. We also try to keep a balance of diversity. We have a public nomination system open through out the year, check the Speaker Nomination Page. We also pull speakers from outside the nomination. The final selection is the Curator’s call and often based on the collective knowledge and intuition of the organizing team. I’m attending the event! What else should I know? CHECK EMAILS! And you must read this PDF (Click to view).